A sparkling tree in an elegant family room. The Carpenters and Perry Como tell us that “there’s no place like home for the holidays,” since it is here that we gather family and friends around us to share the joy of the season. How were people in the Copper Country celebrating with their loved ones and neighbors a hundred years ago? Perhaps one of these parties or events sounds like one you would enjoy–or maybe like one that’s already on your schedule! In December 1911, the Calumet Woman’s Club had a “fine Yuletide Program” featuring “opening and closing numbers by twelve little girls” clothed in German Christmas apparel. 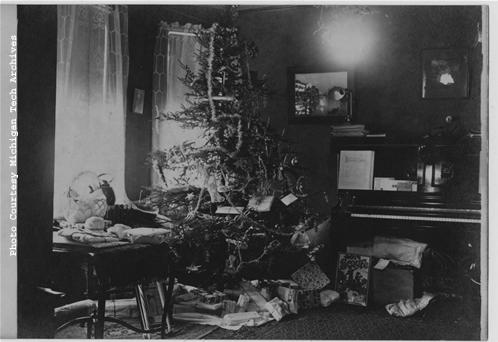 Members of the club sang German carols and received “a little Christmas gift, direct from Berlin” as they enjoyed a luncheon of sandwiches, cookies, and gingerbread. From the Calumet News on December 21, 1910. 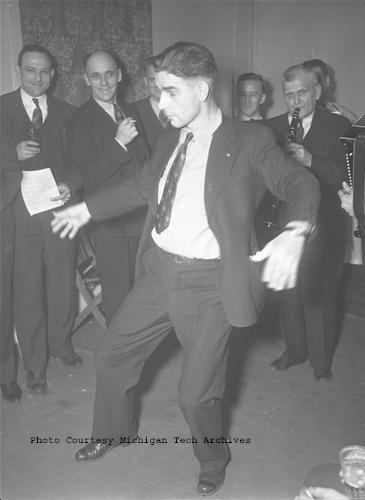 Ice skating was a centerpiece of many parties organized by groups of coworkers. 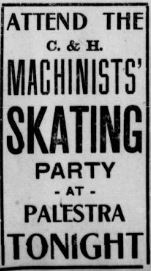 Calumet & Hecla Mining Company (C&H) machinists gathered at the Palestra in Laurium in December 1910 for their outing, while the Calumet telephone operators hired the C&H band in December 1916 for their skating party at the Colosseum Rink. Children enjoying a skating party. In 1916, the Ladies of St. Vincent de Paul of Keweenaw County prepared 1,000 bags of candy and nuts to give away to local children at a party in Ahmeek. 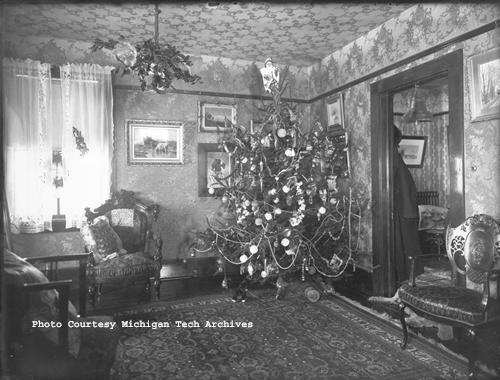 A decorated Christmas tree, with toys and other gifts adorning it, and an appearance by Santa Claus were the centerpieces of the gathering. A festive tree overflowing with gifts. Residents walking through Red Jacket (Calumet) the night before Christmas in 1909 were greeted with the sweet sound of carols, courtesy of the Cornishmen in the Laurium Male Choir, who had commandeered the sidewalk before the Red Front store to share their music. On December 25, 1911, the Jewish ladies of Calumet hosted a splendid “Chanika [Hanukkah] ball… for the benefit of the Jewish cemetery” just outside town. Tickets to the event sold like hotcakes. Chassell celebrated its Christmas in 1916 with a pageant and present distribution at its Knights of Pythias Hall. “All nationalities, creeds, and social orders” in the village “joined enthusiastically” in the jubilee, coming together with unity to share the peace and harmony of the season. 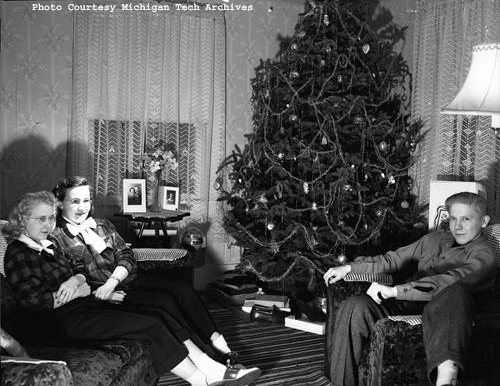 We at the Michigan Tech Archives hope that your holiday celebration, whatever form it may take, offers you the same joy and togetherness! 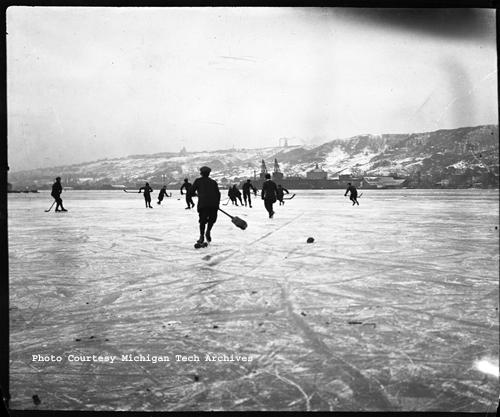 Please note, the Michigan Tech Archives will be closed from Monday, December 26 – Friday December 30 for the holidays. We reopen at 10 a.m. on Monday, January 2. You may contact us via copper@mtu.edu over the holiday break. Happy holidays! 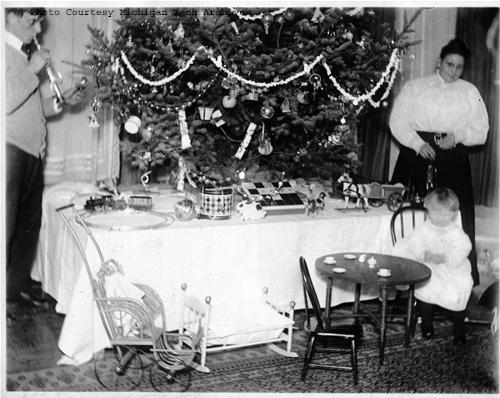 A man, woman and child stand around a decorated Christmas tree. From the Herman Gundlach Collection. The holidays are nearly here so there is no time like the present to start preparing for the festivities! For a vintage spin on your holiday preparations, we’ve ventured into the stacks to find some recipes from cherished cookbooks. We hope one of these scrumptious vittles will make it onto your holiday menu. For a glimpse at other vintage recipes, stop down to the Archives and see what is cooking in the stacks. 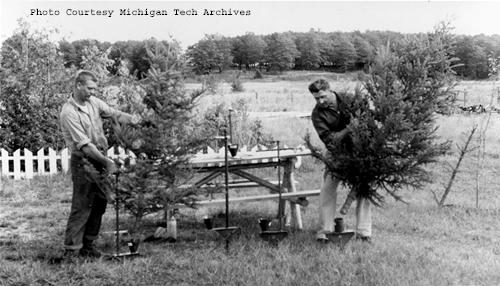 Please take note that the Michigan Tech Archives will be closed to the public from December 21-25 and December 31-January 1. We will be open, with limited service hours of 10 a.m. to 2 p.m., on December 28-30. We will resume normal business hours on Monday, January 4, 2016. For your holiday cocktail party or open house, why not try these savory meatballs in a red wine reduction. Grind meats and suet together, running through food chopper three times. This prevents the meat balls from breaking so easily. Mix with bread, eggs, onion, garlic, seasonings, and milk. Make meat balls about ½” in diameter and brown on all sides in hot drippings. Remove from pan; blend flour, water, burgundy, and bouillion cube in pan, cook stirring constantly until thick and smooth. Return meat balls to pan; cover and simmer for 30 minutes. Transfer to chafing dish to keep warm. Two men demonstrate how to use the Clouthier tree stands. This photograph is part of the Daily Mining Gazette Photograph Collection. To replenish after chopping down your tree or for a little nip around a roaring fire, try this classic egg nog recipe. To make a quart take three eggs, nearly a pint of good fresh milk, sugar and spice to suit the taste. Put these in a pitcher; add hot water to make a quart; then stir or change from one vessel to another until thoroughly mixed; then add a wine glass or more of the best whiskey. Wine may be used in place of whiskey. The eggs and sugar must be thoroughly beaten before being put with the hot water. Drink hot. A family scene in the living room. The photograph is part of the William Brinkman Collection. Nothing beats warm Kropsua and berries for your holiday breakfast to get you ready for an afternoon of sledding or snowshoeing. Melt butter in 8×12” pan. Set aside to cool. Mix all other ingredients in a deep bowl and beat with rotary egg beater until smooth. Last of all, add melted butter. Pour batter in same pan as butter was melted in. Bake in hot, 400 degree oven, for 1 hour. Serve hot with berries or plain. 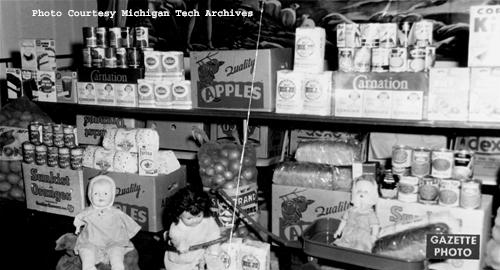 Goods collected for the Salvation Army’s 1958 holiday food drive. The following recipe requires some patience, so perhaps start now and it will be ready for your New Year’s Eve festivities! Make a brine that will bear an egg, and drop in the cucumbers; cover them with grape leaves; weight them down, and let them stand ten or more days. Then take them out, drain well, and a day or two in plenty of clear water, frequently changed. Afterward, put them in a kettle with grape and cabbage leaves and a lump of alum. Cover with weak vinegar, and let them stand until they turn green. Then take out, drain, and put into stone jars. For each three gallons of pickles use one gallon of cider vinegar, and place into it one ounce each of mace and celery seed, two ounces of ginger, three ounces each of cloves and stick cinnamon, four ounces each of mustard seed (black and white mixed), choice black pepper and allspice, two tablespoons of ground mustard, a handful of chopped horseradish, two pods of red pepper, four onions, and two pounds of sugar. Boil, and pour it hot over the pickles. More sugar can be added to suit the taste. Cover the jar very closely, and expose to the sun every day during hot weather. The recipes above were transcribed from The Blend of a Century, a cookbook compiled by the Iron County Historical and Museum Society in 1981 and Did They Really Eat That? : A 19th Century Cookbook That Acquainted Immigrants With Northwoods Pioneer Fare, a volume reprinted by Copper Sun Publications in 1992. 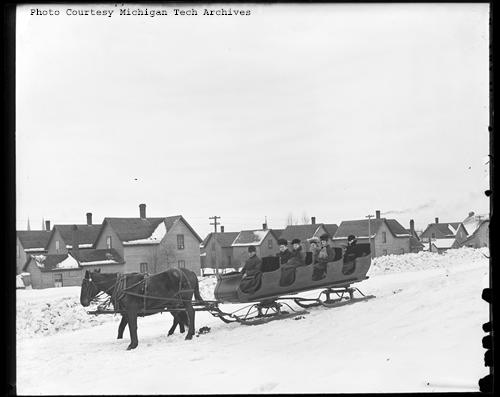 The Michigan Tech Archives will be open for special hours over Winter Carnival Weekend from 10:00 am to 2:00 pm on Saturday, February 7nd. Ever since Winter Carnival debuted as the Ice Carnival in 1922, Michigan Tech students have found reason to hope for piles of snow and below freezing temperatures. Though traditions other than the iconic snow statues have held fast throughout the decades; the winter Carnival Queen coronation, races, broomball tournaments, the Snow Ball, the beard contest and others have all withstood the test of time. Scroll through some of these winter carnival memories and see for yourself how constant everyone’s favorite Winter Carnival tradition has remained. Clicking on an image will take you to the available bibliographic information for that image.